BAHARTPUR, July 31: A female rhinoceros has died in Nawalparasi district of Nepal while giving birth to the calf, the preliminary investigation has found. 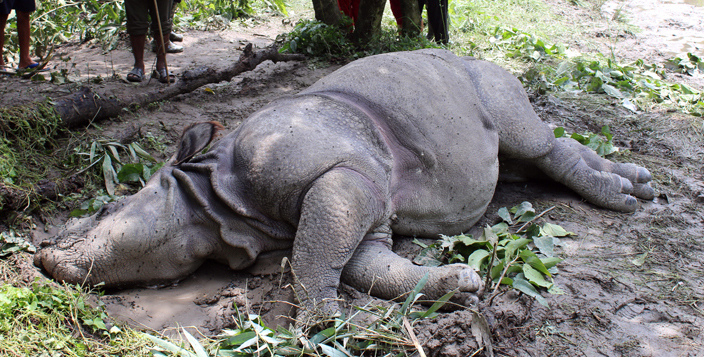 The locals of Kawasoti Municipality-71 of Nawalparasi informed the authorities about the dead body of Rhino in Amaltari of the district. The Sector Forest Officials of Kawasoti informed the age of dead rhino to be of 16 years and was pregnant with the horns intact ruling out the possibility of poaching. An autopsy team from Sauraha is on its way to Amaltari for post mortem of the dead mammal.